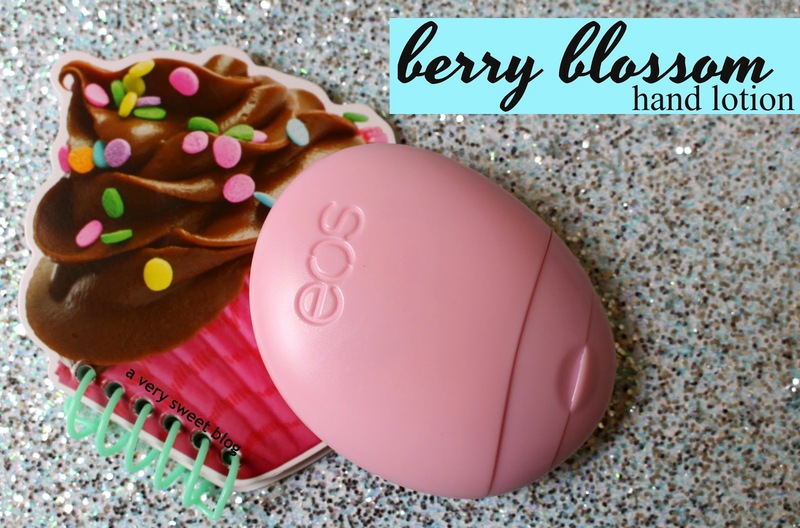 berry blossom hand lotion & vanilla mint visibly soft lip balm sphere. Below are my thoughts. 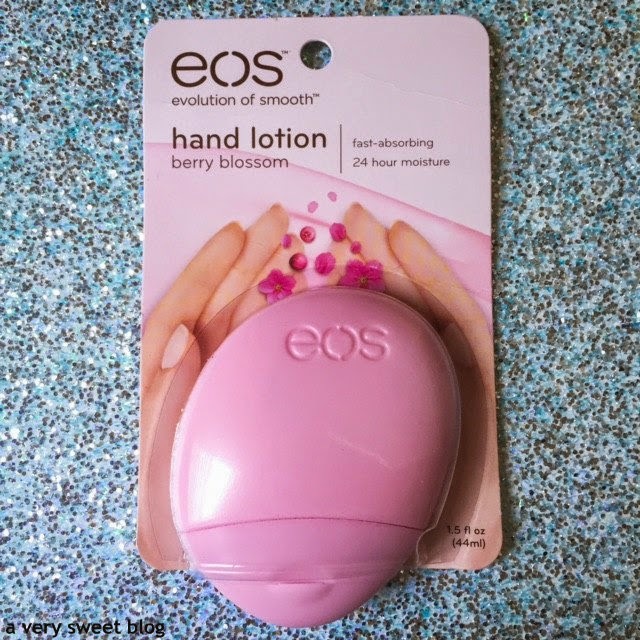 The berry blossom hand lotion ($1.99) by eos, is shaped like a flattened egg and fits in the palm of your hand. I like that the packaging is not bulky or heavy. I wear a lot of crossbody bags, so this easily fits into smaller purses, pockets and overall doesn't take up much space. The scent (while in the container) is like strawberries & cream! It's a fresh scent! The container, despite being hard IS easily squeezable. Squeeze it once and enough product comes out. The lotion is creamy and absorbs into the skin. Your hands will feel super soft after using this lotion. This lotion's berry scent quickly dissipates once applied, and turns into a blossom scent (faint floral scent). It's very pleasant. What level of moisture are you looking for? This moisturizes...but it's light. My dry hands quickly absorbed the first application. I had to apply two more times for better moisture. This lotion is non-sticky and non-greasy. It's fast absorbing. So overall, it's truly a decent hand cream. I give it a sweet rating. It is hypoallergenic, dermatologist tested, 90% natural, paraben & gluten free and contains no animal by-products. BTW, how do you like my cupcake pocket notebook? HaHaHa I bought it for only a dollar at Michaels Craft Store. I always need something to jot notes down. 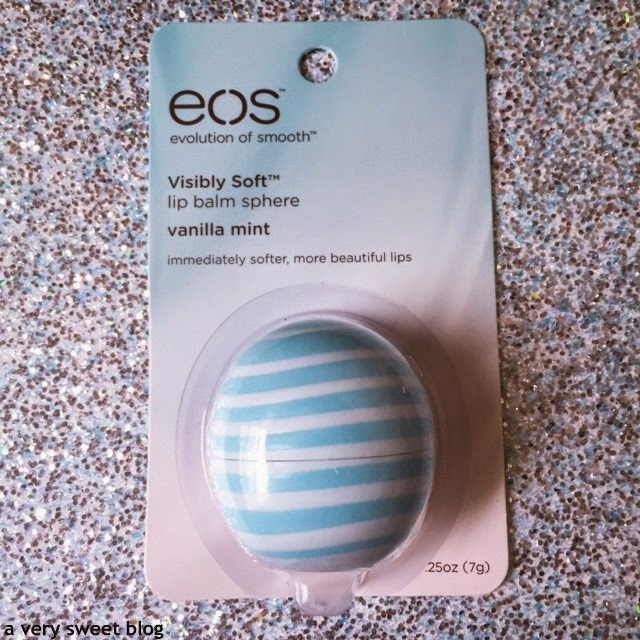 The eos vanilla mint visibly soft lip balm sphere ($3.29) has conditioning oils, shea butter and vitamins C & E. The scent reminds me of shortbread cookies. This lip balm moisturizes, but it still has a waxy feel to it. 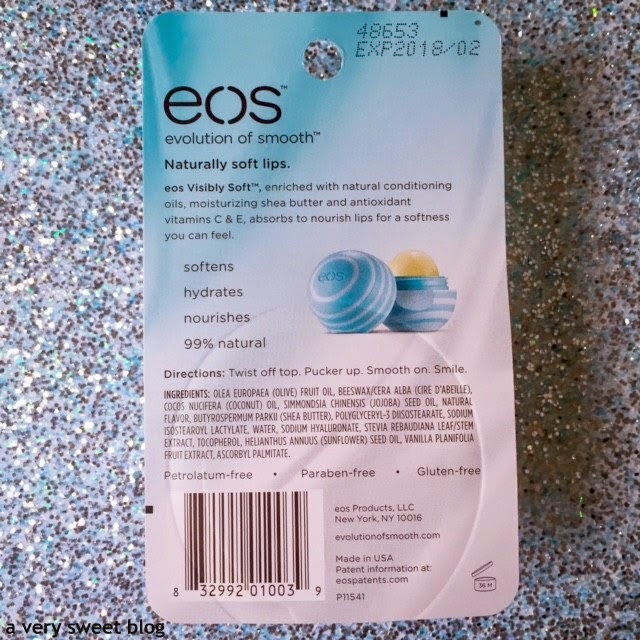 I've reviewed eos lip balms before and still feel the same way. A lot of people LOVE their lip balms, but I prefer Fresh, Origins & Avon stick lip balms. I also got this Hello Kitty tin, with mints in them at Michaels Craft Store. Click here to read all of my eos reviews. Nice review Kim! I'm not a fan of the eos lip balms either. I've been tempted by that one though because the packaging is cute ha ha. I did try the lotion and it was okay. I like the packaging and it's nice for my purse like you said! I have an EOS lip balm in Coconut Milk and you're right it is nothing to write home about but still decent for the price. Oooh, I've been curious about the EOS lotions! I personally love the lip balms, haha, so I want to try their other products as well. Great review Kim! I really want to try that hand lotion! 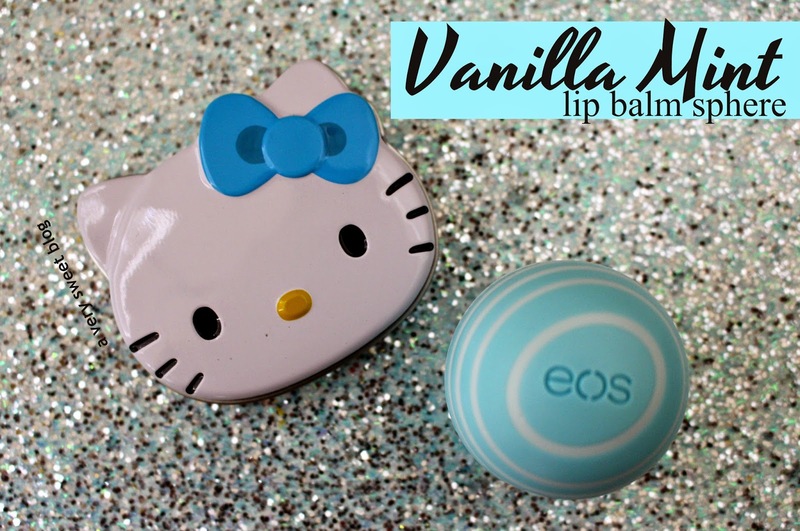 such a cute bottle :) I've use their lip balms before they are nice! 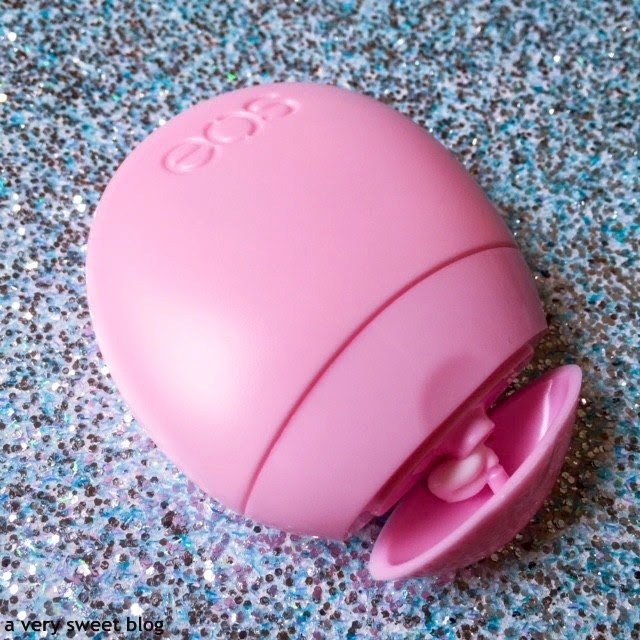 I picked up the EOS Lipbalm on a holiday as we can't get them here in Aus and although they're in quite cute packaging and everything it wasn't anything to write home about! Haha I haven't seen the Hand Cream before though- interesting! Hey Kim! I'm just back from holiday and have A LOT of catching up to do - first things first, loving the new look! Swit swoo, it looks great. Secondly, I was just whelmed when I tried the eos balm too - never knew they did lotion! ooh, i was curious about their hand lotion. glad to hear it's good...and cheap! and, as cute as they are, the lip balms aren't my favorite. 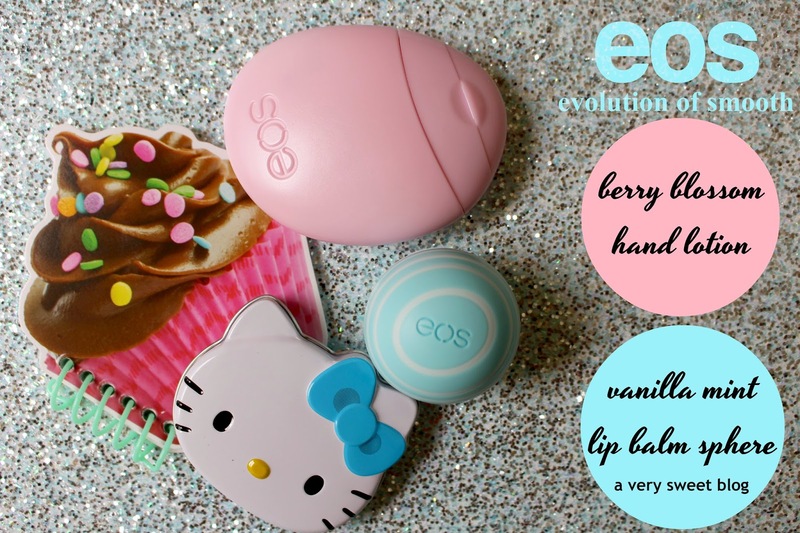 I have that hand cream love the smell and the eos lip balm they all rock and work for me. Great review. I'd heard about the lip balms (probably from your blog too Kim!) but I didn't know they did moisturiser too. Im a big fan of EOS balms, but you're right....Fresh beats them all! Yeah, I think I'll stick with my Jack Black lip balm. It's too perfect to take any chances. The lotion might get a try at some point though. Cute Hello Kitty tin! I wanted to like the eos lipbalm cause of the cute packaging but like you I also found the formula to be too waxy. From your description of the hand cream I don't think it would be moisturizing enough for me either. Thanks for the honest reviews Kim! Surprisingly I don't mind EOS lip balm, I have one and it's been okay for me. I agree it's a little waxy but it made my lips feel comfortable. I like the sound of the hand cream, Kim. I've seen it but never picked it up to try. My current hand cream is about to run out so will pick this up next to try. good to know about this moisturizer. and yes, the notebook is so adorable. great price too! 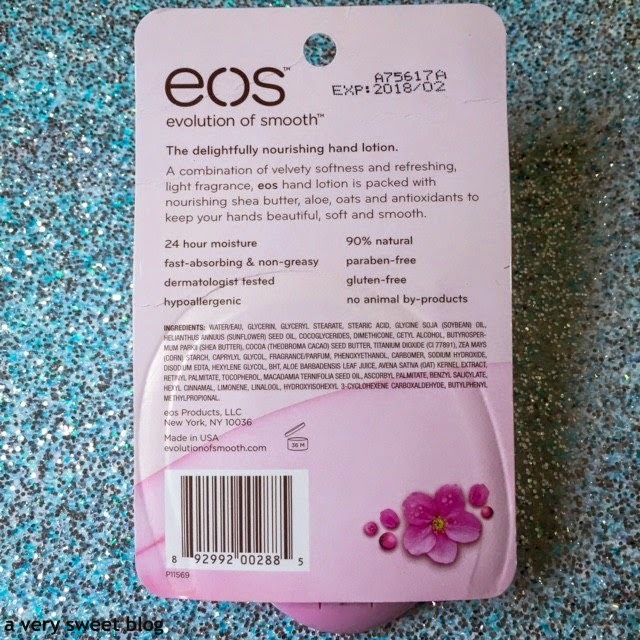 I'd love to try the EOS hand cream - the container is quite smart. As for the lip balm, I own one a friend gave to me, its ok - but i have to agree it is a bit waxy. I've been so curious about the hand creams. I did try one of the lip balms, but it was just okay. Like you said, there are lip balms that I like better. I'll have to check out these hand creams, though. Another great review, Kim! I have mixed feelings about lip products that you have to use your finger to apply, but I think the lotion could be great for travelling - and the price is perfect! 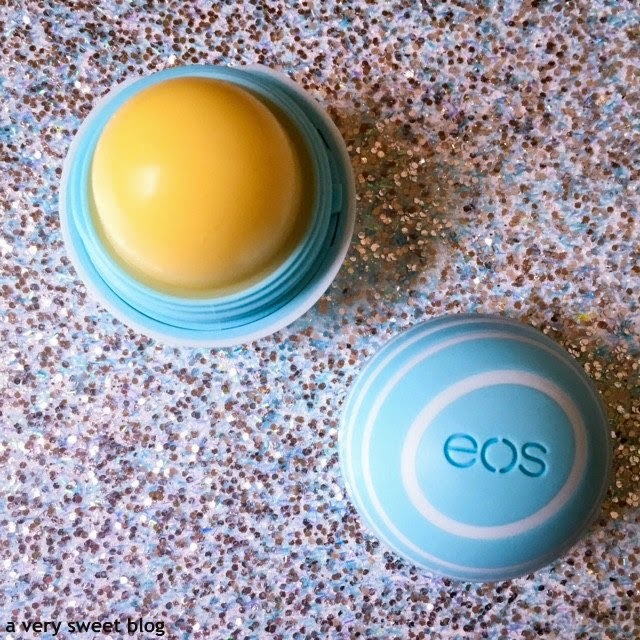 I have had the EOS balm and it is so wonderful. My Mom even had the lemon scent one and loved it. I think they are so fun too to carry in a purse and make a great stocking stuffer! Hope you are doing well !! I have tried the EOS lip balms too. The flavours are amazing. But the Avon lip balms work best for me. The lotion looks functional too. Cute notebook, these products have a very affordable price, shame you do not have convinced balm. 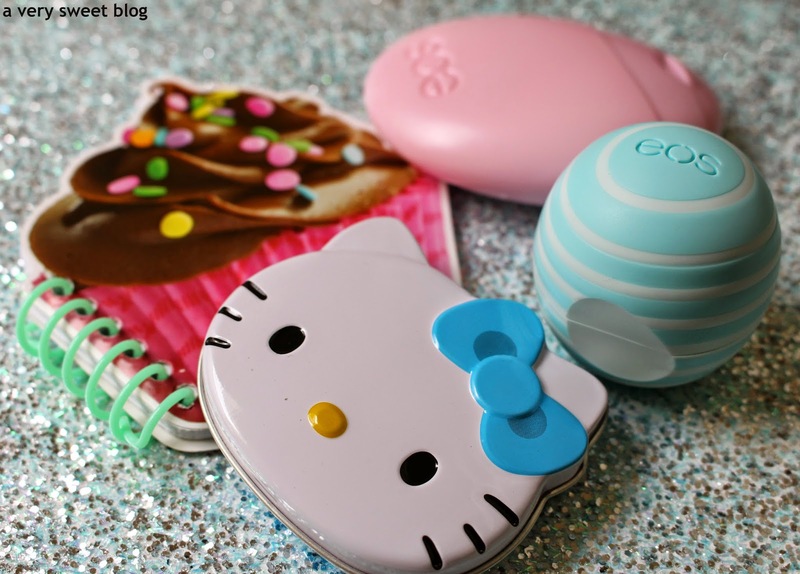 I love the fact that you added the cute cupcake notebook and Hello Kitty tin with these hand lotions. They matched perfectly! Fantastic review Kim! I won't be trying the lip balm! At least the lotion looks convenient! I am the one who love EOS lipbalms. But my sister for example doesn't like them at all. They are too heavy for her. Well, I like them and I am always happy when she sends them to me, as they are not available in my country. I have seen the handcream before but I have never used it. I'd love to try it! You've got me already by mentioning VANILLA! Love it! I like eos lipbalms. I use them at night before I go to bed. The scent is always amazing. Too bad about the waxy feel! I kinda dig the sphere shaped lip balm!